When Steve, 58, and Kathy Wade, 61, from Myrtle Beach, first visited Belize’s Placencia peninsula almost 12 years ago they were smitten with the friendly locals, tropical vibe, unspoiled beaches, and blue Caribbean, so they decided to make the move. They made the right choice. Over the years, development and more tourists and expats have come to the area. And services have improved to keep pace. You can get high-speed internet everywhere. The road was completely paved four years ago and real estate has boomed with new developments being put in up and down the peninsula. 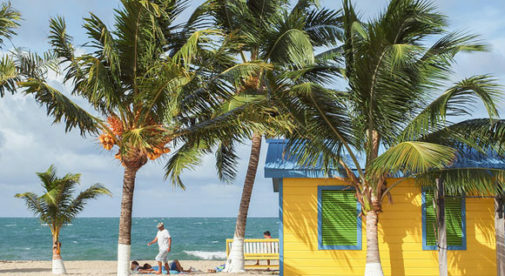 Placencia is now firmly on the map for those seeking retirement in a place where the locals speak English, the weather is always warm, and wearing no shoes is no problem. “The only thing I miss from home is family and close friends, but we do stay in touch,” says Kathy. Their two-story beach-style house, on the “lagoon” side facing the mainland and the distant Maya Mountains, is their refuge where they enjoy sunsets with drink in hand and pleasant temperatures year-round. “The temperature stays in the 80s. We have windows in our house we haven’t closed in five years,” says Kathy. Unspoiled Carribean beaches, friendly locals, and a tropical, “no shirt no shoes” lifestyle is what you’ll find in Placencia, Belize. The Wades love their home. 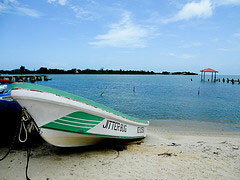 In many ways Placencia remains the laidback and relaxed community they fell in love with. And they say that they enjoy the conveniences the improved infrastructure has brought. The couple keeps busy with a lot of volunteering with the Belizean community. They’re charter members of the Rotary Club. And, drawing on her training from her previous career as a firefighter, Kathy has long been a member of the volunteer fire department and is currently fire chief. Steve is Santa Claus every year, handing out toys collected during an annual drive and participating in a Christmas show. They also help out with the Easter Egg hunt. And Kathy tutors schoolchildren. Steve also makes custom steel guitars in his home workshop and ships them to customers around the world. And he plays guitar with several local bands at watering holes up and down the peninsula, including the Pickled Parrot just off the beach in the village at the tip. “We have a blast. I love playing music,” says Steve.